Goodreads summary: "Once a century, one person is chosen for greatness. Elisa is the chosen one. But she is also the younger of two princesses, the one who has never done anything remarkable. She can’t see how she ever will. Now, on her sixteenth birthday, she has become the secret wife of a handsome and worldly king — a king whose country is in turmoil. A king who needs the chosen one, not a failure of a princess. And he’s not the only one who needs her. Savage enemies seething with dark magic are hunting her. A daring, determined revolutionary thinks she could be his people’s savior. And he looks at her in a way that no man has ever looked at her before. Soon it is not just her life, but her very heart that is at stake. Elisa could be everything to those who need her most. If the prophecy is fulfilled. If she finds the power deep within herself. If she doesn’t die young. Most of the chosen do." I've been PINING for this book for a year before reading this. And guess what: TOTALLY AMAZING! Seriously, I LOVED this book. I would have read it in one sitting if something trivial like sleep and my internship hadn't gotten in the way. So now that I've gotten my gushing out the way, let me tell you all the ways this book blew my mind. First, OMG the whole godstone lore! It was so amazing! I'm not a religious person, but I was intrigued by this whole thing. Especially when this system of a chosen one getting a godstone is being turned on its head! I'm so excited to see where the author will take this in the next book! And Elisa, seriously, if you like strong female characters in your fantasy, this is the girl for you! She has a real backbone, isn't afraid to laugh at herself and is just a NICE person. It was refreshing that she starts out being very much overweight and actually has a personality instead of just being pretty. She shows such character growth throughout the book, it was wonderful. And then there was THE BOY. Oh Humberto, how you made my romantic little heart flutter with your amazing boyness you! And the storyline, it was amazing. And I had kind of guessed something that would be important at the end of the book, but I had NO IDEA it would turn out like this. This whole world blew my mind and I'm dying to find out what will happen to Elisa in the next book. Which needs to be here now instead of October 2012! How will I survive in the meantime?? Seriously? If you couldn't tell already, I loved this book so much I'm not really coherent about it. Which means you should all go read it. 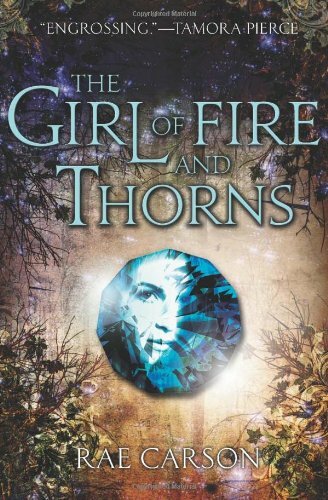 If you like fantasy and good books in general, you will enjoy this. Every review I've read makes this one sound really good. I've been really wanting to read it! Hopefully soon! I liked this one too! I think the thing in the spoiler had to happen so something else that I have suspicions about can happen later in a sequel..maybe! I really enjoyed this book...once Elisa started moving and doing stuff. While I understand the setup, I kept waiting for the action, which I eventually got! great review!! thx for sharing... I really want to read this now!! - before I was wondering. How do you read the spoiler using an iPod touch? @Bookworm1995: I have never actually even seen an iPod touch (I feel somewhat technologically challenged saying this), but if you can select it somehow you should be able to read it I think. What a awesome review! I have been wanting to check out this one, it looks so good! Thanks for your thoughts! Tahleen reviews: "mental_floss: The Book"